Have you noticed that there is a natural bond that happens between people who practice yoga? If you feel that, you are not alone. You might be surprised at what could actually happen if there was a place where yogis could gather to hang out, gain knowledge, sit in a circle and open up in community to the deeper layers underlying everyday life. For years, I’ve heard people talk about how, “we need that”. And for the past five years, I’ve often looked at the empty space next door to Peachtree Yoga Center. If you have visited Peachtree Yoga over the past couple of weeks, you may have noticed the construction happening in that space next door. Responding to the call from many yogis in the Atlanta area, Peachtree Yoga is introducing a new venture of the heart. Synchronicities are starting to happen. Several yogis have stepped up and asked what they can do to help birth this new idea and introduce it to the world. We are calling it Atlanta Yoga Fellowship. In our busy lives, we are often surrounded by a lot of people, and yet we long for real connection with people of like mind. Bring along your family and friends to share this beautiful moment and space for us to come together as community. Its official! 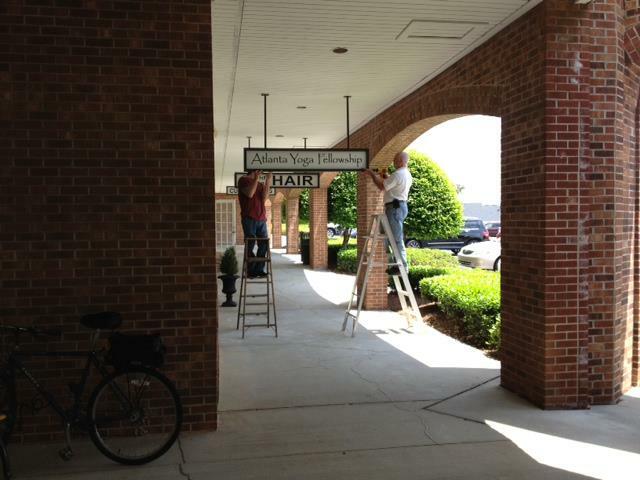 Atlanta Yoga Fellowship sign hanging today! The Grand Opening of the Atlanta Yoga Fellowship will be held on Sunday, May 19th from 5:30-8pm. Join us for the ribbon cutting starting at 5:30p at Peachtree Yoga Center – 6050 Sandy Springs Circle Atlanta, Georgia 30328. Following the ribbon cutting will be refreshments & dinner, brief centering and talk about the intention of this space. Followed by a handprint ceremony. Please RSVP on Facebook or at the front desk of Peachtree Yoga Center. 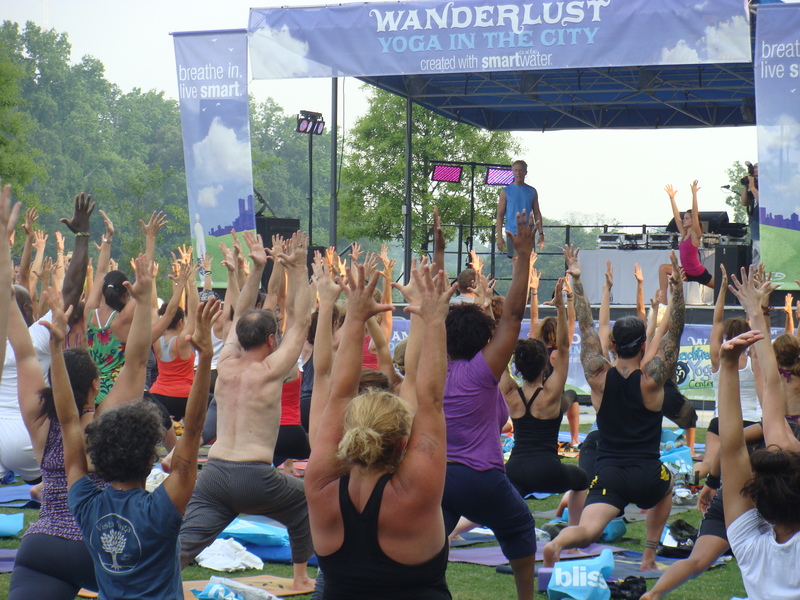 Graham Fowler, founder of Peachtree Yoga, has trained and certified over 500 yoga teachers. 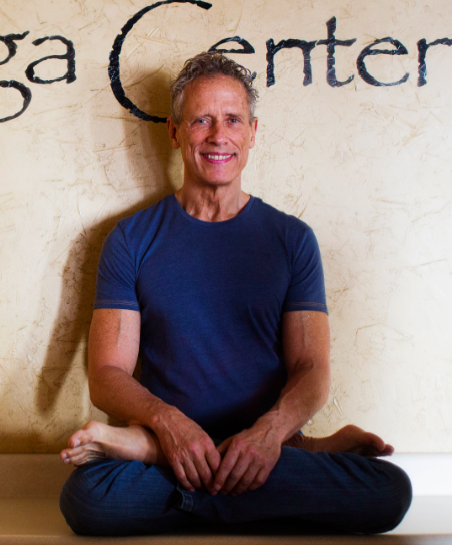 He brings a rare opportunity to explore the deep, subtle, and life-altering potential that Yoga practices offer. His teaching arises from the depth and breadth of 40 years of study and practice of the yogic arts. His exploration of yoga began with meditation in 1973 and continued under the guidance of many Indian and Western hatha, tantra, and meditation masters. Graham loves to help people discover the wonders of their deepest selves through the mirror of asana, meditation, and conscious community. Graham, I am so happy to see how you have followed your dream! I found this article today while researching people for my personal memoirs. Would love to communicate at some point when you are open. Meanwhile, congratulations my friend!!! So happy to see you following your life dream!!! Congratulations to you in the opening of your new center. I wish you all the best! This is wonderful! I have often thought that yoga should have more of an opportunity for socializing, as people who tend to practice yoga tend to be seeking the light. It is great to have the opportunity to mingle with other yogis in Atlanta!